Short-term, low-risk outings are ideal for discovering the optimal applications for and extreme limitations of gear, supplies, and skills. If the test succeeds, the lessons can be integrated into longer and riskier itineraries; if the test fails, at least the misery was short-lived and non-consequential. Hammock camping in cold weather is an advanced skill, perhaps even more so than ground camping in the same weather. For beginner hammock campers, test your system on low-risk, short-term outings first in order to develop your skills and know-how. Note the full-length under quilt for winter temps. Photo by Jack Tier of Jacks ‘R’ Better. Buy your hammock from a manufacturer that specializes in backpacking hammocks. Make sure it is designed for nightlong sleeping, not just afternoon napping. A few light hammock models use smaller dimensions that may confine you. For example, the Grand Trunk Nano-7 Hammock, and the BIAS Weight Weenie Micro 52 Hammock are both only around 50-52 inches wide, versus the 65″ wide of the Warbonnet Blackbird. Shorter and/or narrower hammocks also limit your ability to sleep flatter on a diagonal to the hammock’s center-line. Even a light hammock should be full sized and functional. The 12 oz, $75 Dream Hammock FreeBird is a full 11 feet long and 60 inches wide. Some campers pushing into the 175+ lb weight range are fine with lighter hammock body fabrics (e.g. 1.0-1.1 oz nylon). Other campers in the 175+ lb weight range feel that these lighter hammocks do not give enough body support even if they are technically within the hammock’s weight range, and therefore opt for 1.7-1.9 oz or heavier hammock body fabrics. Buy a tarp with adequate coverage. To sleep warm and dry in a hammock you need to keep wind and rain away from your hammock body. Smaller diamond or asymmetric tarps, e.g. the Hennessey Hyperlite Rainfly, affectionately known by some as a “napkin tarp,” may not provide adequate protection from blowing rain, or from the cooling effects of wind. While a few ounces heavier, a more pragmatic choice may be a larger hammock-specific “hex” tarp. A fairly standard hex size is a 10.5-foot ridgeline with an 8.5-foot width. Due to the large tarps typically used with hammocks, some campers have opted to go with Spinnaker or Cuben fabric tarps to save weight. Compared to sil-nylon, Cuben fiber weighs half as much, but costs 2-3x as much (about $250-300 for a hammock tarp). Buy a good under-quilt for your hammock. Its performance will be much superior to a ground pad, even if you have a double-layer hammock to properly control the pad. A good under quilt will make a critical difference for warmth and comfort. Some use a 3/4 length quilt and use a small pad under their feet, typically a foam sit-pad (which I prefer). Others opt for a full length under quilt. Buy a top quilt when you can afford one — they are much more hammock-friendly than conventional mummy bags. In the interim you can use an unzipped mummy spread out like a quilt. Avoid fussing about exotic suspension systems and hanging hardware. The basic webbing suspension systems supplied by manufacturers like JRB and Warbonnet are excellent — inexpensive, easy to use, and strong. At most, they weigh a few more ounces than more expensive exotic suspension systems. If you own a gathered end asymmetric hammock, make sure you have drip lines, or place a carabiner on the suspension system near the attachment to the hammock body. Otherwise, water will run down the suspension and into your hammock. Bridge hammocks do not share this problem. The Ultimate Hang: An Illustrated Guide to Hammock Camping, by Derek Hansen, is an excellent and comprehensive book for hammock camping. And the Kindle version is only $3.99. Hammock Forums is the largest online resource for information on hammocks. Like any large internet forum, its well intended members offer an incredible wealth of information. Also, as with any large internet forum, there is a smidge of less-than-perfect information, plus a couple of folks who are hanging in a different planetary orbit. Warbonnet Outdoors has two useful how-to sections on its website: Hammocks 101 and setup videos. Hennessy Hammock also has very good how-to videos. Dutchware Product’s amusing videos are fun even if you don’t buy his stuff, though he does design some good products too. Serac Hammocks has an informative beginners guide. Derek Hansen, author of The Ultimate Hang, is an advanced hammock camper and excellent illustrator. If you have learned nothing else from this 3-part series, study Derek’s illustration below. What critical tips for first-timers are missing? If you are a veteran hammock camper and feel that I missed some important tips — in this post, or one of the first two — for first-time hammock campers, please submit it as a comment, below. It’s worth noting that a lot of hammock gear can be fairly easily DIYed. Whenever talking learning about hammocks, it’s worth noting Shug’s (a prominent member on HammockForums) videos. They’ve created many more than one hammock convert. I’m really glad that this blog chose to present this series. Hammocks are strong in their own niche, but I think they’re summarily dismissed by the California-heavy population of ULers. To be fair, if you plan to spend much time above treeline, a hammock is a limitation. But having grown up in Appalachia, the advantages of a hammock were immediately apparent to me. 2. Keep it simple. The folks on Hammock Forums are incorrigible tinkerers, and a lot of them give no thought to weight and/or complexity. It’s easy to turn following tip (1) into a never-ending spiral of experimentation. That may be your style, and if so, more power to you. But I’m guessing most readers of this blog want a reliable, simple, lightweight set-up that they don’t need to fuss with. With discipline, this can be done with a minimum of iterations and expense. Alan, the only thing I think is missing here is a short nod to taking a hammock to the ground. Those that dismiss hammocks because of lack of anchor points (e.g., “above the treeline”) may benefit from knowing that a hammock kit can be pitched on the ground similar to any tarp set-up. 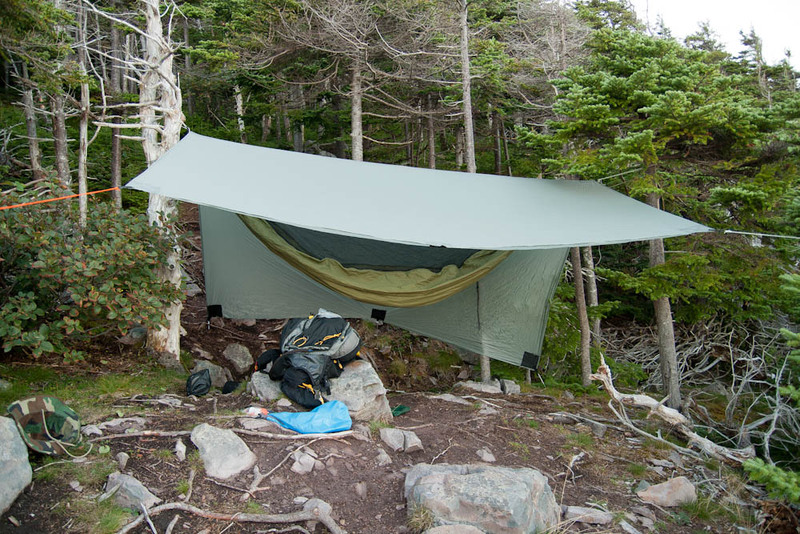 A lot of UL hikers use minimal tarp systems like the Gossamer Gear Twinn, using trekking poles or sticks to erect their shelter. A hammock with an integrated bug net easily doubles as a ground bivvy in such cases. In other words, if you enjoy hammock camping or are curious about starting, don’t worry so much about limited “natural” anchor points, especially if you look at hammock camping as modified tarp camping. Hammock camping may be one of the most versatile and modular systems available. With content like this I made the right decision to let my BPL subscription lapse. A great 3 part guide to hammock backpacking. I would not need, or use one in the UK, but seeing them used in the US this summer in the East coast mountains below tree-line they make total sense, and are ideal for the reasons mentioned. Great post Alan. I love the wealth of hammock knowledge that’s continuing to populate the internet. When Trek Light Gear first began back in 2003 I had to explain each and every hammock benefit (and challenge) to every customer I came in contact with. Now, it’s still exciting to see how many people are new to the concept – but because of the spread of information it’s amazing to see how many people are coming into the hammock camping lifestyle with an already great understanding of what it offers. If you could add Trek Light Gear to the hammock company list in the post I’d sincerely appreciate it – we’ve been spreading the hammock love for almost 10 years now and would love the chance to help more people get into hammock camping. If there’s anything I can personally do to help anyone reading just let me know! I own a BIAS Weight Weenie Micro, and it’s not fair to lump it with a GT Nano-7. BIAS believes that a comfortable lay comes from the length of the hammock, not the width, which is why they sell a 52-inch wide model, believing that the 11 ft. length of the BIAS hammocks more than compensates for a reduced width. I happen to agree with them, that 10-11 ft. hammocks provide a much better lay, which is why I bought a Weight Weenie Micro (albeit a 60-inch). The Nano-7 sacrifices width and length to achieve its 7.4 oz. weight. At 9 ft. long and 4 ft. wide, it certainly sounds uncomfortable for all but people under 5’7″ or 5’8″ . Interestingly, the BIAS Weight Weenie Micro 52 actually weighs 6 oz, the 56 inch is 6.5 ounces and the one I own, the 60 inch, is 7 oz. All are lighter and longer than the Nano-7. Even the 64-inch Weight Weenie Micro weighs 7.4 oz., just like the Nano-7, but it’s two feet longer. I have to agree with Em on point 1 & 2. Find what works for you. 1. There are “camps” in the hammock world (just like in most endeavors) that have become fans of a manufacturer or style of hammocks. Not everyone likes a bridge, not everyone likes a gathered end hammock. Not everyone that uses a gathered end will agree about how to whip the ends, how long to make it, or how wide it should be. Sometimes people that are fans cannot see past what they are fans of enough to understand there may be a better way, or a way people like better. 2. Keeping it simple. Especially on HF there seems a atmosphere of tinkering and complicating the set up of a hammock. Like buying a Harley and then tricking it out. A lot of what people do over there is the flavor of the month with continuous ridge-lines, Sling-shot tie outs, multi-pocket gear organizers, pad extenders, etc. If you want to keep it light and make it work if you have to go to ground or get to stay in the trees, simple is better. And simple can be lighter too. You don’t have to have all the bells and whistles to have a great hammock. After all, it is just hiking. Disclosure: Brian from BIAS here! Alan: Awesome article, but I have to agree with Craig. I think looking at hammock width is a one-dimensional view, when the truth is width and length affect the lay of a hammock. I’m a proponent of using square surface inches. I know you’re trying to keep your analysis to less than novel length and we can debate this stuff all day, but you’ve sort of nailed us for our smallest, narrowest hammock (despite larger options) and you’ve categorized it next to a 9 foot by four foot hammock when ours is 11 feet by four feet, four inches. The numbers: 5,184 square surface inches for the GT Nano 7 compared to 6,864 inches for the BIAS WWM in its smallest incarnation which means the BIAS is almost ONE THIRD larger. I do not mean to detract from an excellent explanation of an important facet of camping. It’s a good article and I thank you for introducing others to it. >I’m a proponent of using square surface inches. Good points both of you. The Nano-7 is indeed the exception to minimal size, or should I say square surface. That is, both width and length should to be considered when evaluating the necessary comfort and size of a hammock–not just width. FWIW I am using a 10′ x 60″ hammock with no problems. And duly noted that BIAS hammocks are much larger than the Nano-7, even the Weight Weenie Micro. The Hiker Lite with its poly taffeta bottom and in a 10′ x 56″ size sounds like it would be a very tempting minimal hammock with great support and reasonable weight. While i can sleep in a 1.0 oz nylon hammock I am not entirely enthusiastic about the sag. Both the stiffer poly fabric and 1.4 to 1.8 oz fabric should make the hammock much firmer without a huge weight penalty. Andrew, I’m a huge fan of your book which got me into the modern way of thinking about camping and hiking. (Being a bit of an old timer) – thanks. One comment which you make in the book and in the blog which I think is a huge insight is that you have to ‘learn’ how to use the new techology like hammocks. Tents are pretty straight forward, with hammocks, it takes a fair bit of time to ‘shake down’ the techniques and be comfortable. I have been doing simple one nighters with a friend and our hammocks getting the ‘hang’ of it and have found that each time we go, we are getting better nights sleep. It does take time. Sufice it to say that I am ironing out the bugs before I introduce my wife to the experience. Have learnt over the years that the first night of camping will be a decider as to whether they will participate in future adventures. About going to ground when necessary … many hikers have spent nights with a tarp system on the ground already – going to ground with a hammock set up is very similar. Especially if you use a non-integrated bugnet. I use the 9.5 oz bugnet from Wilderness Logics when hanging my simple/lightweight gathered end hammock. When I have to go to ground, this bugnet is my full enclosure with zipper, I don’t even use the hammock at all on the ground (no need to risk abrasions). Any hammock tarp should work fine tightly pitched closer to the ground than normal using 2 trekking poles or sticks instead of tree trunks. My 1.1 oz cryo ground sheet goes inside the bugnet with my cc pad under me and quilt(s) on top (you can use both top and under quilts for extra warmth in this setup if necessary). For a close comparison, zpacks.com tarp tents actually use a mesh floor by default to save weight, and Joe recommends the ground sheet on top of the mesh to keep any running water under the groundsheet. Thanks for this Fred! This came in very helpful for me. I’m currently deciding on a setup and am leaning toward the non-integrated netting. You have not only confirmed my decision, but made me think, now I need to consider the details of the netting too. You may also want to put a link to hammock bliss. There no seeum is an excellent entry level hammock. I purchased mine at go fast and light which seems to have the best price for it. After using it for 2 years it will be the one that I stay with. Been reading up on hammock camping for weeks now. I haven’t been real camping in 10yrs due to back problems and cant sleep on the ground. But from reading your stories and stuff I feel that a hammock might be the way to go. So thanks in part to you guys im going for a quick two nighter this weekend. Im so excited to be getting back out there. Thanks. Sgt Rock has elsewhere made this point: With larger hammocks it is easier to find the sweet spot. And a point I have made elsewhere is that mfgs were not for so long too cheap or hide-bound as to not try longer or wider hammocks. The new point I’ll make here, consistent with Sgt Rock’s: So tennis and racketball racket faces have grown larger. The bigger sweet spot, harder to miss, hasn’t created better tennis players. I prefer stiffer hammocks. The materials being what they are, unchanged for so long, that means the fabric will be heavier for me to have my comfort. a tip i would add is to hang your feet end of the hammock 9 inches higher than your head end,this i have found stops bunching up in the foot end at night whilst asleep and the leg end being higher is practically un-noticeable. great write up btw,an enjoyable read. Excellent overview Alan, I have been sleeping and camping in hammocks for almost 50 years and appreciate a nice clean introduction to it like yours. Derek H’s recommendation about “go to ground” options is critical. Please read the “sticky” articles at hammock forums BEFORE any on going crazy discussions by us engineer and research scientists who are excessively technical, passionate, and opinionated. An incremental approach to a new hobby or sport is always the best. Hammock hanging has actually been very simple and effective for thousands of years, have fun with it, your back will be more healthy. great article and great page – thank you! Interesting, although quite expensive, those under quilts. Actually I’ve never seen or heard about them here in Europe..
What I always did (and still do), was to lay my cheap camp pad inside the hammock (right under me). It does the job – it insulates. In addition to that, a camp pad is very cheap, can be used to sleep on the ground (if there are no trees around), and I think it should be lighter than a under quilt. On the other hand, I imagine, that under quilts are way more comfortable. This one is suitable for summer use.